The Minister of Communications, Mr Adebayo Shittu, says Information and Communication Technology (ICT) could grow and sustain the Nigerian economy. He spoke in Ibadan at the Eminent Person Business Lecture organised by University of Ibadan School of Business (UISB). “The country is presently in a recession, but it is not because we are in it that we are concerned. “We are concerned because each time there is a sharp drop in prices, we enter into a recession and we want to make sure that this cycle does not continue. “And the only way we can do so is to diversify the economy by leveraging on ICT and moving the economy from being resource-based which it has been since independence,” he said. Shittu stated that the role of ICT and telecommunications was very significant and critical in any society, particularly in Nigeria, which was striving to be a new nation by leveraging on ICT. He said that the telecom sector alone contributed over 60 million dollars to the nation’s economy in the last 17 years of its existence. “Given its immense contribution to economic growth, we are working assiduously with the National Assembly to declare all telecom infrastructure across Nigeria ‘s critical National Assets,’’ he said. The minister said that the there was compelling need for policy intervention in the form of a digital service strategy. Shittu also said that the high cost of governance in comparison with digital service delivery, low level transparency, accountability and considerable resource leakages must not continue. “The policy concept rests on a vision which envisaged the development of a sound digital infrastructure. “This is pivotal to effective, efficient, transparent and accountable service delivery for improved quality of the social and economic life for the citizenry,” he saidHe said that the industry currently provides more employment than the oil and gas sector, adding that the industry contributed about 10 percent to the country’s Gross Domestic Product. “ The time has come to fully embrace ICT to enhance transparency and good governance if we really are to fulfil the ‘change’ mandate Nigerians voted President Muhammadu Buhari to bring about. “It is arguably one of the fastest growing sectors of the Nigerian economy and is the second largest ICT market in Africa. “Industry analysts have extrapolated that ICT tools and devices, software solution, IT outsourcing and e-commerce sectors alone could employ over 40 million Nigerians and contribute billions of dollars to our economy,’’ he added. Shittu said that the mission was to deploy ICT in all the sectors in a very effective and efficient manner so as to diversify the economy in a sustainable manner. He said that it was important to maximise the potentials and remained competitive for the economy to be strong to withstand shocks. “Otherwise, after sometime, we will relapse to what the situation used to be and the problems would start again,” he said. Dr Umar Mustapha, the Pro-Chancellor and Chairman of Council, University of Ibadan, said that there was still hope for the nation, considering the contribution of ICT to GDP and the millions of job it created. Mustapha commended the Federal Government on the proposed construction of eight ICT hubs across the nation. Prof. Idowu Olayinka, the Vice-Chancellor of the University of Ibadan, stated that UISB was established with a vision to make it the most preferred fountain of knowledge in business education, research and management. Olayinka said that the establishment was not only for regional development but for the productive integration of the African continent into the global economy. 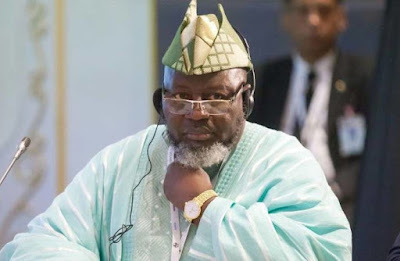 The Oluwo of Iwo, Oba Abdur-Rasheed Akanbi, called on government to embrace outsourcing and industrialisation of the country to ensure the transfer of technology. The monarch enjoined government to engage more in land leasing rather than outright sale of land in the country.